How does the UCI Health Weight Management Program differ from other diet programs? We believe long-term weight management requires a commitment to a healthy lifestyle that continues after the initial weight loss. Established in 1987, our program has a track record of helping people keep weight off. We focus not just on the number of pounds lost but also on risk-factor reductions when weight loss is accompanied by improved management of blood pressure, glucose levels and cholesterol. Our staff—which includes physicians, dietitians, exercise physiologists and nurse practitioners—takes a whole-person approach to long-term weight loss and health management. I can lose weight, but I can’t keep it off. How can your program help me with that? Weight management is a two-part process. First, you lose weight and improve your health. Next, you develop, practice and master the skills you need to keep off the weight. Our program provides accountability, plus an emphasis on exercise, nutrition, behavior change and risk-factor reduction—all while developing positive lifestyle changes. Why do you use meal replacements? 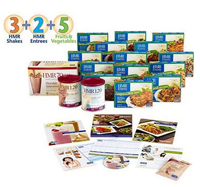 Meal replacements are convenient, portion-defined foods, such as shakes, bars and entrees. They are the only dietary medical intervention backed by evidence showing that they help people lose more weight and keep it off. How long will I be on your program? This depends on which program you choose and how much weight you need to lose. The length of your program is tailored to you and your goals. Program fees vary according to the length of the weight loss phase and the level of medical supervision you need. Specific details are presented at our information sessions. Do you have resources that can help me?